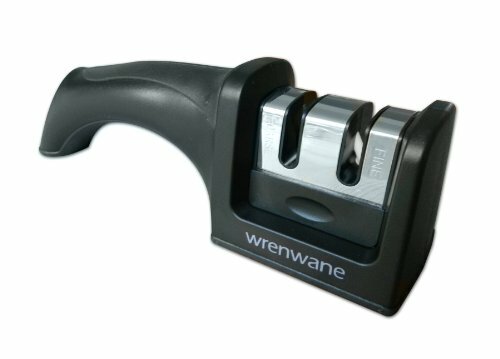 Wrenwane kitchen knife sharpener is uniquely designed to provide the user with maximum knife sharpening. The sharpener’s design has black and silver appearance that is attractive to the eyes. This unit provides you with a practical as well as simple solution for your blunt knives. The sharpener is lightweight; therefore, you can conveniently carry it around. The unit is equipped with two different sharpening modes, which include coarse sharpening mode and fine sharpening mode. The coarse slot is made of tungsten carbide while the fine slot is made of ceramic. The sharpener’s design takes into consideration the safety of the user. As far as coarse and fine knife sharpening is concerned, this is a unit worth the money. Wrenwane kitchen knife sharpener is made of sharpening rods that are designed from ceramic for fine knife sharpening, and tungsten steel for coarse knife sharpening. These two materials provide the industrial standard quality for high quality sharpening. The sharpener is equipped with two sharpening openings for coarse as well as fine sharpening. The unit is easy to operate; all you need to do is pass your blunt/ dull knives through the coarse rods. On the other hand, you should pass any of your knives that require fine/ smooth sharpening through the fine rods. The unit is designed to provide maximum safety while sharpening, with non-slip base and easy grip handle. This device is particularly designed to allow you to sharpen your knives at ease without any possibilities of you hurting yourself. The unit’s handle is incorporated with an easy grip that allows you to conveniently hold it steadily in position during the whole sharpening process. The sharpener’s non-slip base makes it sturdier on the kitchen counter. This prevents the unit from sliding while you are sharpening. The unit can conveniently be handled manually, since you can hold the handle with your right hand as well as your left hand. The sharpener’s utility is high, since it grinds both sides, and it is durable and tough. As far as resourcefulness is concerned, this is the most ideal sharpener for the money. In addition, this unit is primarily designed to sharpen steel-straight edge knives. Wrenwane kitchen knife sharpener measures 7.5 by 2.0 by 2.4 inches, and it weighs 5.6 ounces. The unit’s weight makes it ultraportable, and the convenient knife sharpener to carry around. This knife sharpener is highly attractive, and it is a tool that anyone will want to possess. The sharpening slots are made of ceramic rods and tungsten carbide blades. Wrenwane kitchen knife sharpener is designed to provide maximum safety while sharpening your knives. The unit has strong as well as easy grip handle that allows you to hold it firmly while using the sharpener. 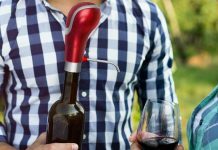 In addition, it has non-slip base that prevents the whole device from sliding while in use. This is a lightweight as well as attractive knife sharpener. The unit’s measurements and weight make it ultraportable, and convenient to carry around. Its attractiveness adds up to the collection of beautiful kitchen accessories. The coarse and fine openings are made of industrial standard quality material for sharpening high quality knives. The coarse sharpening slot is made of tungsten steel rods, while the fine sharpening slot is made of ceramic rods. Wrenwane kitchen knife sharpener is worth the money, since it is of excellent value for a knife sharpener. You do not actually need to test it with damaged knives, since it does the job right from the very first time you use it on your expensive knife. The sharpener is specifically designed to work on steel-straight edge knives; therefore, it is not an appropriate knife sharpener for serrated or ceramic knives. You should buy this knife sharpener if you are after a unit that is highly attractive, ultraportable, and well-packed with features that provide positive results. This unit’s sharpening slots feature industrial standard materials for sharpening expensive knives, including ceramic rods for fine sharpening and tungsten carbide rods for coarse sharpening. The sharpener is designed to keep you safe from any possible dangers that may arise while you are sharpening your knives; this is achieved by the easy grip handle and non-slip base. Each and every penny is accounted for as far as Wrenwane kitchen knife sharpener is concerned. This four star knife sharpener is designed to provide your steel-straight edge knives with the appropriate razor sharpness. The unit’s design is not only simple, but also equipped with unique features that make certain you achieve exceptional results each time you drag a knife in the sharpening slots. The sharpener’s two stage process ensures that your knives are worked on correctly, and any possible damages are evaded. There is no greater feeling than having a knife that cuts through your vegetables smoothly. Well, you will have to make use of this knife sharpener in order to experience such quality each time you are in the kitchen.